LactiCyte™ HD - Now with CyteTrak™ | Page & Pedersen International ltd. The robust PC driven LactiCyte-HD provides rapid, accurate and affordable somatic cell counts for cow, goat, sheep and/or buffalo milk. The LactiCyte-HD covers a wide range (from 0.1 to 10,000,000 SCC/mL). The range for actionable outcomes can be customized by the User (i.e. "Warning Level", "Critical Level). Just insert a cartridge and test results are reported in <60 seconds via on-screen display, printout and USB interface. An Automated Microscope based on Image Cytometry using fluorescent dyeing technique and magnification approach to cell counting, the results are recorded by a charged-coupled device (CCD) camera digitalization of the actual cells. 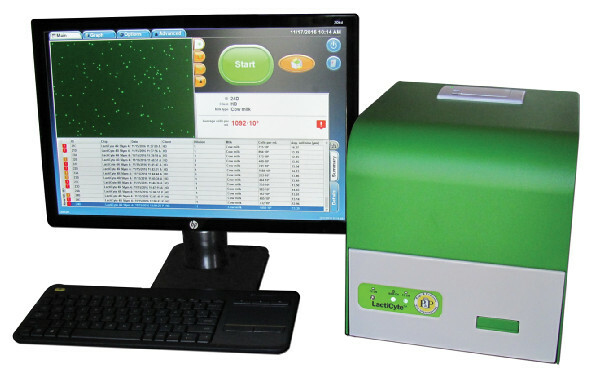 The LactiCyte-HD has an excellent correlation with the Direct Microscopic Somatic Cell Count (DMSCC) methode. The CyteTrak gives you the capability to sort and filter data created by the LactiCyte-HD, so you can get the essential data you need from the LactiCyte-HD's compacted data recorded. 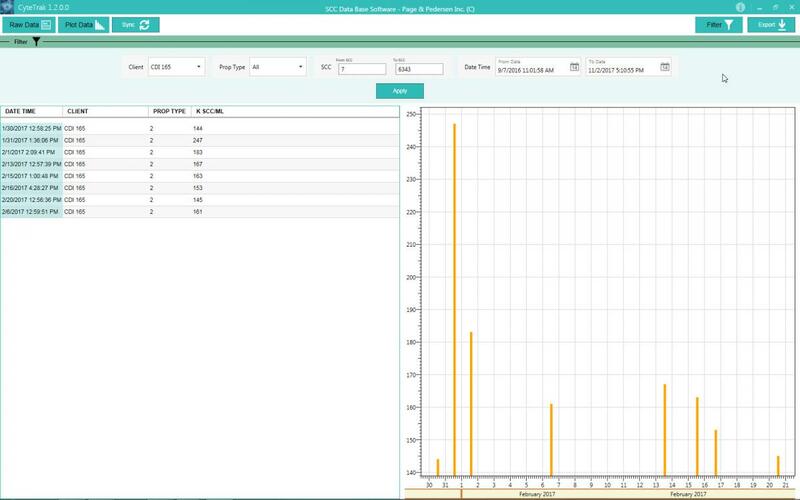 You can filter and graph by date/time, by client (animal, tank name, etc), or on a specific range of SCC test results. An exceptionally practical instrument for small and mid-sized labs, the LactiCyte-HD features an impressive correlation with Direct Microscopic Somatic Cell Count. Choose between the budget-priced quick test (16 pictures) using a four channel cartridge or a more precise test (36 pictures) using two channel cartridges. Options for more in-depth analysis are also available. See Advanced Mode. Optimize herd management by proactively (not reactively) monitoring SCC real-time to facilitate early intervention (also in cases of sub-clinical mastitis). See positive outcomes in herd health & milk quality while realizing cost savings. Treatment can be closely monitored for timely and positive outcomes with potential cost savings. The digitized, visual image of somatic cells counted can be enhanced to assist in specific dairy studies. The precision and accuracy of the LactiCyte-HD provide an excellent and affordable tool for introducing students to total somatic cell counting techniques. Results provide critical data in qualifying required parameters to preserve integrity of milk protein for nutritional benefits and optimize onward manufacturing.